Embedding YouTube videos into your WordPress blog is an excellent way to keep your visitors engaged and interested. Whether you wish to embed your video content or someone else's, WordPress makes the process straightforward and hassle-free. This article applies to both self-hosted (wordpress.org) and free-hosted (wordpress.com) blogs. oEmbed is a format that lets you copy the video URL directly into the WordPress' editor, no additional code is necessary, and you can use either the full URL or the shortened one. From your WordPress Dashboard, select Posts > Add new. Select the + icon to add a new block, then select YouTube. Go to the YouTube video you wish to embed, select SHARE, then select COPY. Go back to your WordPress post, paste the video URL, then select Embed. 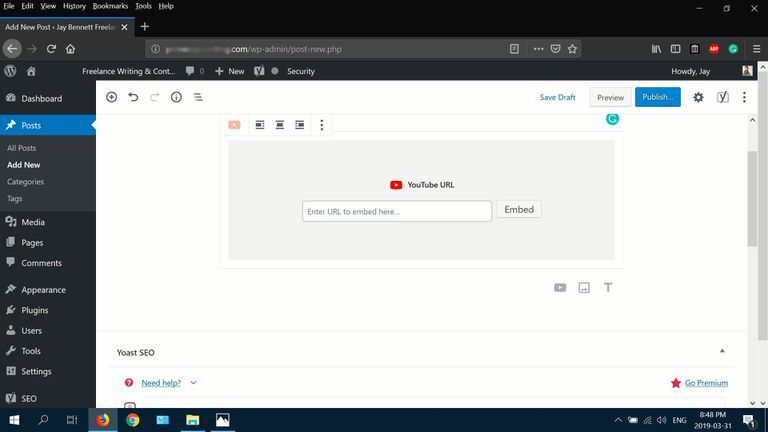 You can also paste the YouTube URL directly into the content editor, in both visual and text view. Select Publish to make your video go live. If you prefer to place a YouTube video in your blog's sidebar, use the video widget. Ensure your WordPress theme supports sidebars to utilize the video widget. From your Dashboard, select Appearance > Widgets. Drag the Video widget over to the blog sidebar. Give the video a title, then select Add Video. Select Insert from URL in the upper left corner. Enter the video URL, then select Add to Widget once the video appears. YouTube offers a wide variety of player parameters to help customize the playback experience. Embedding your videos with iframes allows you to customize how the video player looks and functions with options like autoplay, language preference, video width/height, looping, playlist, and several more. From the WordPress content editor, select HTML. Go to the YouTube video you wish to embed, select SHARE, then select EMBED. Paste the iframe code into the HTML box in WordPress, then select Preview. Select Update if the video looks right. Experiment with different Player Parameters within your iframe code for full customization. Add each parameter after the source (src) URL. Using a plugin is another reliable method for embedding YouTube videos. From your Dashboard, select Plugins > Add New. Enter "youtube embed" into the plugin search box, choose a plugin, then select Install Now. Select Activate once the plugin is installed.